In the innocent days of the very late 20th century there was The Family Computer. This single computer sat in a home’s communal space and was shared by each of that home’s residents. For many of us, those days are long past. As computers have become more affordable, portable, and necessary, it’s now common to find multiple Macs scattered throughout a home. And because it is, it’s just as likely that some of those Macs have been retired—replaced with faster or lighter models. When that happens the question of what to do with an old Mac invariably arises. Given a multi-Mac household and the need to retain the data stored on those Macs, one of the first things you should consider is turning that old Mac into a backup server—one Mac to rule the backup roost. Doing so isn’t an overly expensive proposition and it’s relatively easy to set up, run, and maintain. Ask Apple about multi-Mac backups and you’ll likely be directed to its Time Capsule ( ) wireless hard drive. Time Capsule is an acceptable and easy-to-use solution as it allows you to back up multiple Macs running Leopard or Snow Leopard to a single device via Apple's Time Machine. However, if some of your Macs are using an older version of the Mac OS, you’re out of luck as they don’t support Time Machine. Additionally, if you have a lot of data to back up, the 1 or 2TB of storage found on a Time Capsule may not be enough. And, of course, at $299 (1TB model) or $499 (2TB model) you’re paying for features beyond storage, including wireless routing. A Mac-based backup server allows you to get around these limitations. With the right software you can back up not only Macs running older versions of the Mac OS, but Windows PCs and Linux computers as well. You can add exactly as much storage as you need (and upgrade that storage at a later time). And you pay only for back up software and storage rather than a wireless router that may be redundant given the gear you already own. Ideally, the Mac you designate as your backup server isn’t a power hungry beast (think Power Mac G5). A first-generation or second-generation Mac mini or MacBook is a good candidate in this regard because it doesn’t require a lot of power. Regardless of which Mac you choose as your backup server, create a schedule within the Energy Saver system preference so that it’s on/awake when it needs to back up your other computers and off or asleep when it’s idle. The backup server and all the Macs you wish to be backed up will have to be on the same network. For the fastest backups, use a wired Ethernet network (preferably gigabit Ethernet). If that’s not possible, use a wireless network and be prepared to leave your Macs on for an extended period of time while they’re backed up. Alternatively, if you have many Macs with a lot of data, are anxious to get this over with, but you’re unwilling to wire your home, it might be worth your while to drag all your Macs into the same room as the backup server and perform the initial backup over a wired network (or bring your Mac server to each client computer). Once that’s complete, return the computers to their original locations and perform subsequent incremental backups over your wireless network. Those incremental backups won't take nearly so long. In regard to storage, hard drives are today’s easiest way to store backups. 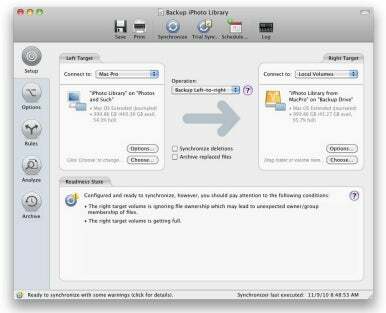 Storing backups on CD or DVD is fine if you have little data and a single Mac to back up, but it’s more trouble than it’s worth to babysit a multiple-Mac backup using optical media. Unless you have a Mac with an easily upgradable hard drive (an old Mac Pro or Power Mac G5, for example) you’ll want to get an external hard drive. Shop around and you can find 2TB external drives for around $150—internal 2TB drives can be had for half that. A power-efficient Mac mini makes a great backup server. Next, calculate the amount of storage you need to back up all your computers and then double or even triple it. Thanks to massive media files and libraries, we store a lot of data these days. Unless cloud storage really takes hold we can expect to store increasing amounts of data in the future. While a 1TB drive may seem impossible to fill today, next year it may prove to be positively cramped. Part of the backup battle is figuring out what you should and shouldn’t back up. If you don’t have a lot of data and do have plenty of storage, there’s no harm in backing up your entire Home folder. As long as you store your important data within this folder, you’re set. However, if you routinely store data outside of your Home folder—at the root level of your hard drive, for example—you should consider moving it to within that Home folder or prepare to configure your backup software so that it looks in such nooks and crannies for your data. If, however, you’re backing up multiple Macs and all of them have a significant amount of data on them, you must be choosier. At this point, ask yourself this important question: Which of this data will cause me to burst into tears when it’s lost? For many people the resulting list will contain these items: Personal photos and videos, e-mail, financial data, in-progress work projects, personal creative projects, contacts, calendar events, and bookmarks. Now work your way through descending layers of potential regret. For example, if you’ve purchased a lot of content from the iTunes Store (music and videos rather than books and apps, as you can easily re-download the latter) or spent weeks ripping your CD collection, you’ll want a backup of this content somewhere. On the other hand, you can probably exclude the college papers you penned in the mid-90s and that archive of jokes forwarded to your AOL account. Additionally, if you have your application installers (or can easily download them) you needn’t back up your applications nor their support files—iDVD’s themes and GarageBand’s loops come to mind. There are many backup options available to you. Apple’s Time Machine couldn’t be easier to use and is a solid solution for single-computer backups. Both Bombich Software’s free Carbon Copy Cloner and Shirt Pocket Software’s $28 SuperDuper are solid choices for making bootable backups. For straightforward backups of multiple Macs I prefer Econ Technologies’ $40 ChronoSync ( ). If you have a mixed environment of Macs and PCs (running Windows and/or Linux) the venerable Retrospect 8 (now owned by Roxio) is a good, though occasionally complicated, option. ChronoSync. Although its name hints that it’s a synchronization tool, with version 4 ChronoSync became a more powerful backup tool. At its most basic you choose a source—a folder on your Mac, for example—and a destination, which might be the external hard drive attached to your Mac. Click the Synchronize button and the selected source files are copied to the destination in their current state—as individual files and folders, making it easy to restore just the files you want. But it can also back up the data from Macs on the network. Simply mount the drive of a networked Mac, choose it or a directory on it as the source, and then select a destination—again, the backup drive attached to your Mac running as a backup server. When choosing a networked drive you can ask ChronoSync to mount it if it’s unmounted. (You have the option to store the username and password necessary to mount the server so that ChronoSync doesn’t prompt you for this information when it performs the backup.) ChronoSync can also be configured to unmount the drive when the backup is complete. ChronoSync is an affordable, flexible solution for multi-Mac backup. ChronoSync provides options for deleted and updated files. Enable the Synchronize Deletions option and any files you delete from the source will also be deleted on the backup. Enabling the Archive Replaced Files option instructs ChronoSync to keep a copy of all the revisions of a file. So, much as you can with Time Machine, you can visit ChronoSync’s archive area and retrieve older versions of documents. Although ChronoSync can mount networked drives and volumes, for a multi-Mac backup setup I’ve found it wisest to install a copy of the company’s ChronoAgent on each Mac I wish to back up. (ChronoAgent costs $10 for a single copy and $40 for a 5-user license.) ChronoAgent brings a couple of advantages. First, it communicates directly with ChronoSync. This direct connection allows it to scan files more quickly than it can using the normal AFP or SMP network protocols. It also allows ChronoSync access to the entire contents of a Mac’s drive rather than just approved folders and directories. ChronoSync, mounting and backing up network volumes by itself, may encounter permission issues. When used with ChronoAgent you don’t have these issues. Also, those Macs running ChronoAgent can be configured to back up their data as soon as they connect to your network. This is handy for backing up laptops that have returned from a road trip or have been unavailable during a scheduled backup. With ChronoAgent installed on all my Macs, my workflow goes like this: I install ChronoSync on my Mac mini backup server. Attached to the Mac mini is a 2TB hard drive. Each of the three Macs I back up has a copy of ChronoAgent. I create a separate ChronoSync Synchronizer document (the document that details a particular backup scheme) for each Mac. I then save these synchronizer documents in a ChronoSync container—a ChronoSync file that contains multiple synchronizer documents that are executed in order when you run the container file. Finally, I create a schedule so that the container file is executed at the end of each work day. Retrospect. In the days of OS 9 and earlier, if you were really serious about backing up, Dantz’s Retrospect was the tool to use. Regrettably, the transition to OS X was a rough one for Retrospect. The interface became more convoluted and Retrospect lost some of its features. In May 2010, Sonic Solutions acquired Retrospect from its owner at the time, EMC, and placed it in Sonic’s Roxio division. The current version, Retrospect 8.2, is a product targeted largely at small to medium businesses. However, the $129 Retrospect Desktop 8 for Macintosh with three clients is an affordable and flexible solution for those who need to back up Macs as well as Windows and/or Linux PCs. 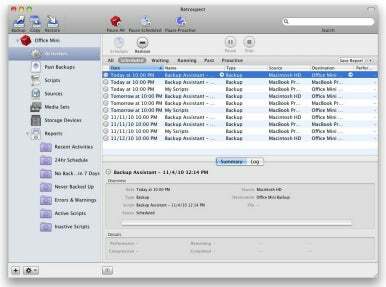 If you need to back up a mixed environment of PCs and Macs, try Retrospect. Where ChronoSync stores data as individual documents, Retrospect creates archives, called Media Sets, that contain the backed up data. A single media set can contain backups from multiple sources—your MacBook’s internal drive, the iPhoto Library stored on a Mac Pro, and the user folder from a Windows PC. And these media sets can span multiple drives, discs, or tapes. A list of a media set’s contents is kept in a catalog, which you can easily scan to locate just the files you want to restore. Retrospect requires that you install client applications on all the computers you want to back up (additional client licenses cost $38 each, five licenses for $149, or 10 licenses for $299). Similar to ChronoSync using ChronoAgent, Retrospect communicates directly over the network with its clients, without the need for mounting volumes or running a file server on the client computer. Also, like ChronoSync, Retrospect includes a feature—called Proactive Backup—that will back up a client as it joins the network, rather than waiting for a scheduled time. Retrospect also has the ability to wake sleeping computers on the network so that they can be backed up. At one time Retrospect was quite challenging to configure and operate, due to a convoluted interface. It has since been significantly cleaned up. Once you’ve added your backup sources and destinations, creating a backup is as simple as clicking a Backup button and walking through a configuration wizard where you choose your sources and the media set you want to use. You can then assign a schedule to the backup scheme (or script, in Retrospect parlance) you’ve created. Easier to use though Retrospect may now be, if you delve into the application’s more arcane settings—configuring clients to be automatically added to the Retrospect server application and tweaking verification settings, for instance—you’ll spend some time with the manual. The old saw of backup is that it’s not a matter of if your computer’s hard drive will die, but when. To avoid becoming yet another sad sidebar to the mortality of modern storage media, be proactive and put that old Mac to good use.